That's a graph of my heart rate as I ran tonight. Section 2 is wandering about the gym and stretching. Section 3 is going home. As far as I can tell, that graph is pretty much exactly what I want right now. Low 140s is about the maximum heart rate that I want to see right now. The other day when I had to take a break, it's because my heart rate was into the 150s. That felt too high for me. My resting heart rate is 55-60BPM. My doctor always says 58, but I was measuring 55-56 tonight. The difference is noise, I think. This is cool! It's exactly, precisely what I wanted. I ordered a Garmin ForeRunner 305 yesterday, and it arrived today. It's a little overkill for running indoors, since GPS is useless on a treadmill, but I was eyeing it last year for bicycling and couldn't quite make the case for it. It was fairly easy to set up, and it's easy to use. I approve. And thank you to loser_variable for recommending SportTracks. That's a slick piece of software. I was going to suggest the 305, but then thought it would be overkill since you're mostly running on the treadmill. I really like mine, but I haven't used the heart rate monitor. I'll have to check out SportTracks. I don't fear the heart rate. I've redlined more than once and generally end up in the 165 range. I figure the extra beats will get that cholesterol moving! For me, 150ish coincides with where my body starts saying, "Hey, are you sure this is a good idea? This doesn't feel good." I respect that feeling quite a lot. I stay in the 150s when I interval train on the elip. Does your resting heart rate stay higher a few hours after your workout? When does it go back down to where you were before you started? With a battery life of up to 10 hours, I would expect you could wear it all day, but is it comfortable enough to do that? I usually go to the gym around 10-11 p.m. I just got the thing yesterday, so I have no idea what the answer to your second and third questions might be. Plus, I usually go to bed around 1. The unit itself is an overgrown watch. The heart rate monitor is an elastic band that goes around your chest. The watch and band only need to be within about three meters of each other, so while I can't imagine wearing it as a watch all day you could keep it on a belt loop or in a pocket. I can do that mentally, as I know exactly what my speed was at any given time... I set it on the treadmill at specific intervals. That's what my walk/run timing list was. Yes, you can do this overlay easily when using the GPS to capture pace. I believe the footpod will accomplish the same thing on a treadmill (calculate your pace at any time), although I don't have a pod but will probably get one just to tinker with cadence. 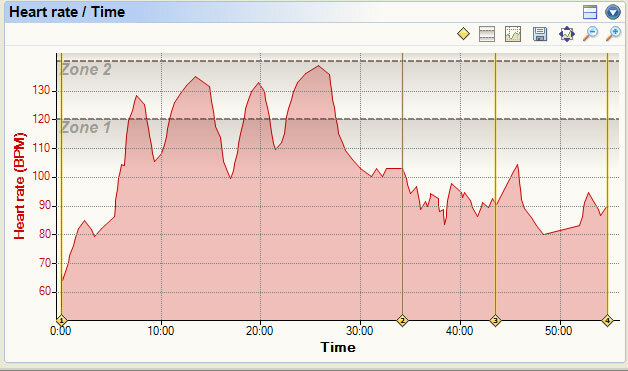 You can also overlay the course elevation profile, to see how hills impact your HR and speed. Anything it captures, you can graph, all at once. Excellent, another convert. The 305 works great on the bike as well. Outdoors you can get a google aerial (or topo) map of where you biked or ran. Click on any point for all the data. Good stuff.